Win a party for your class, extended to Feb. 25th! Our Box Tops Contest has been extended! 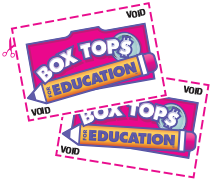 Send in your Box Tops and win a prize for your class, either a pizza party of ice cream party! All students have to do is collect Box Tops from participating products (see a limited list below) gather your Box Tops and place them in a zip lock bag labeled with your child’s name and Grade then turn them into their homeroom teacher or Ms. Elena at the Main Lobby’s Reception Desk. The classes that collect the most will get a great prize! Deadline is February 25th! Below are just some of the companies that are participating. Chances are you are already purchasing them!